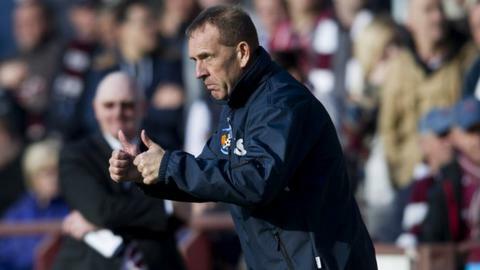 Kilmarnock manager Kenny Shiels was upset with referee Steven McLean's performance in his side's 3-1 defeat to Aberdeen. "I just think Steven could have done better today," he said. "I think he'll be the first to admit it wasn't one of his best performances," said the Northern Irish manager. Kilmarnock now sit sixth in the Scottish Premier League after nine matches, three points behind leaders Hibs. Opponents Aberdeen won their second game in a row for the first time this season. Winger Ryan Fraser was pivotal to the Dons success and Shiels was particularly unhappy with how the referee treated him in comparison to his own wingers. "James Dayton was fouled a lot today. "I thought there was an imbalance in what could have been done," Shiels added. "I'm not looking for excuses, but it did impact on the gameflow." The Kilmarnock manager did however concede that the 18-year-old Aberdeen winger was a player to be admired. "The boy Fraser's a great player for them. "You can't ignore the qualities the boy has, pace, strength, power," the Killie boss admitted. The Ayrshire side were seeking to win three consecutive league matches for the first time since late 2010, however, Shiels refused to be critical of his team. "I don't think we deserved to lose the game," he said. "I'm not going to be too harsh. "We can't play like that against Aberdeen, they're too good." "However, we've come off the back of two really good ones and we just have to start working towards the next game, and hopefully we can win that one."